It's not raining this morning. Which is quite the nice change as we have had a week or so of damp. I made the most of it and planted some kumara (Maori sweet potato) shoots - which I have never grown before so they are a bit of an experiment. My girl's favorite activity in the garden is eating strawberries (who's isn't?) and harvesting. 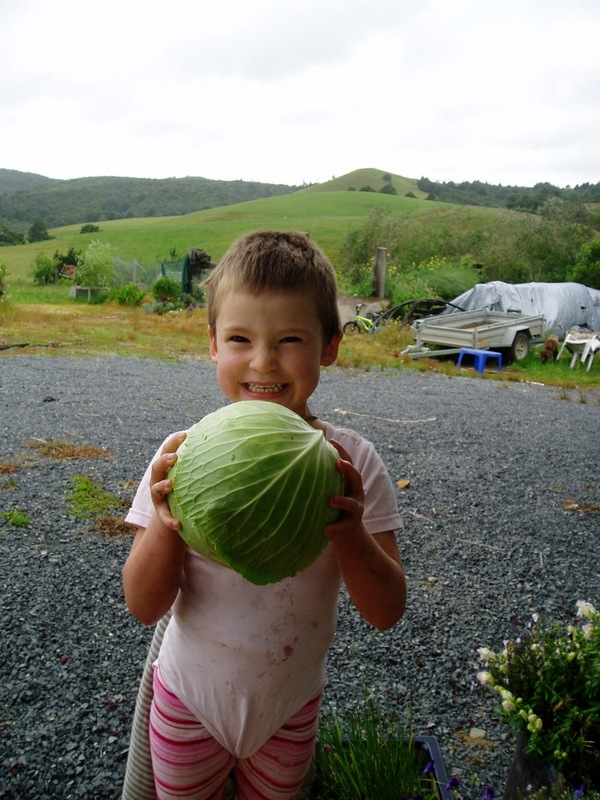 So we rummaged around and chopped this cabbage to make coleslaw to have with our homegrown pork roast tonight (our friend's home, not ours). It was "sooooo big and heavy, Mum" that she insisted we take it's picture. 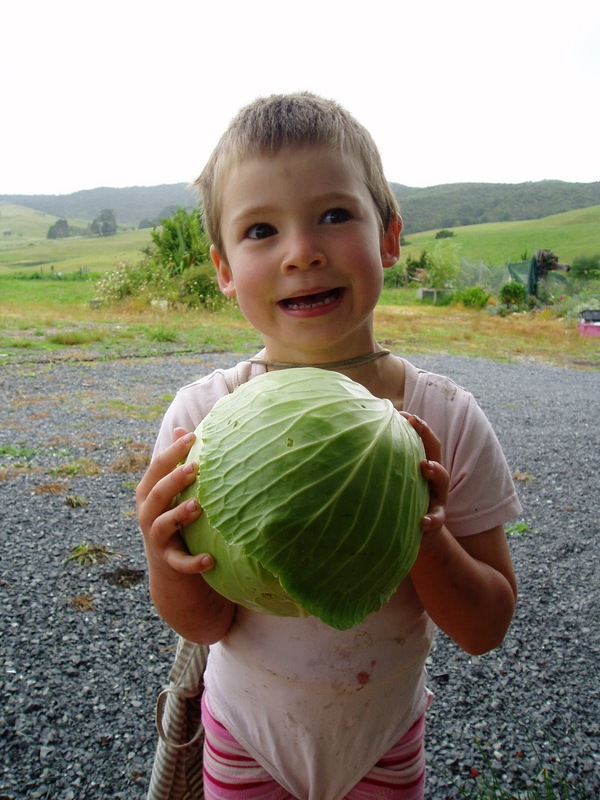 And of course, it needed to be held and shown in all it's glory by the Moppet herself. Last day of school today for Big Brother. School holidays for the next six weeks. Hopefully there will be some camping, some adventures, a lovely Christmas dinner, lots of excitement, a little bit of quilting and a whole lot of fun. So I apologise in advance if there is a distinct lack of blogging, but I'm sure you understand! Wishing you a very merry Christmas, a safe one and a happy one. And to all those parents out there, here's wishing you lots of sanity for the holidays! A while ago I showed you this pile of fabrics and told you that I was making a simple pieced quilt - suitable for fairly mindless quilting when I'm on night duty and have nothing to do. So I've been nutting away at it slowly but surely and the other day I was at the stage of laying out all my finished blocks. These will be eight inches finished. Spot the Amish mistake block - I'll be unpicking that one, there are enough mistakes in it without a glaring one like that. I'm really loving the colours and effect, but I've decided it's not big enough. 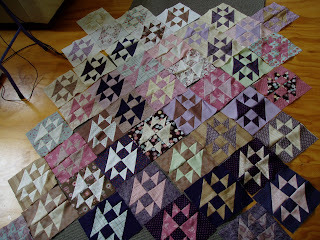 I've cut out and begun to piece another 15 or so blocks. That will make it six blocks by six blocks. With borders, that should be big enough to spread over my king-sized bed. I'm making more dark with dark blocks and light with light blocks and that should help the colourwash-ish effect when I lay them out again. One thing I do lack in my corner of the lounge where I sew is a large design wall. But I find laying it on the floor is ok, especially when I take photos and look at them on the computer screen, things I want to change around become quite obvious. I guess it's the same as taking ten steps backwards. 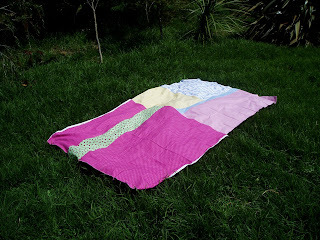 How do you lay out your quilts? What do you use for a design wall if you are lucky enough to have one? 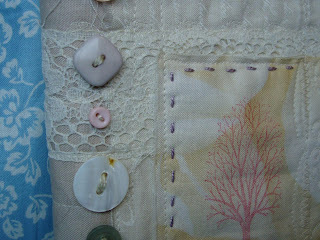 So I spent yesterday sewing, photographing and writing a tutorial for a collaged, lined, fabric book cover. It makes a nice Christmas present if you are looking for some inspiration for a crafty gift. I've added it to my tabs up the top there and I'd appreciate any feedback on how easy it is to read and follow - being my first real tutorial and all! It was held in the woolshed - for non-kiwis - that's the shed where the sheep are shorn. The hosts were kind enough to waterblast it out first! They decorated it appropriately. These are tanned possum skins. Possums are a non-native pest here in NZ and last year there was a dish of crumbed possum drumsticks. Being a woolshed, it had a sheep chute. The chute that the naked sheep are shoved down to head back to the paddock. It didn't take the kids long to find it and it took them less time to start heading down it themselves! These are our two judges hard at work. The trophy is the polished bit of wood to the right and the judge on the right is last year's winner (duck egg pavlova with a loquat and honey sauce). And this is one of the dishes. Presented by last year's runner up. She went all out with three courses. This is the main. Roast Wild Turkey with Rewena Bread. The dressings on the side were things like Wild Grape and Walnut and Grandma's Quince Jelly. And yes, she had matching wine! No, she didn't have any of the wine...it's just soda water and some of my Wild Rose Syrup. What do you think of her haircut? I was cutting her brother's and father's hair and she demanded one just the same! I got in quick before her brother could fill her head with gender concepts and she really likes it. I do too - not knots and no nits. It was a great night. The kids had a ball, we had a ball, the food was interesting and tasty (to varying degrees) and I'm looking forward to next year's. So I survived the half-marathon (on the 17th November, that's how long it's been since I updated this blog!). I walked it in 3 hours and 43 minutes (and 59 seconds if you want to be precise). Not too bad for a first go. The average time was 3 hours and 16 minutes so next year I'm planning to get closer to that. Later that same night I hobbled went off to our friend's annual "Wild Food Cook Off". Basically a party where we all bring a dish of food made from things we have hunted, caught, foraged etc. There was Bombay Horse's Arse (horse curry - yes, we have wild horses up here if you know where to look) and Roast Peacock, Oysters and Banana Flower Burger. 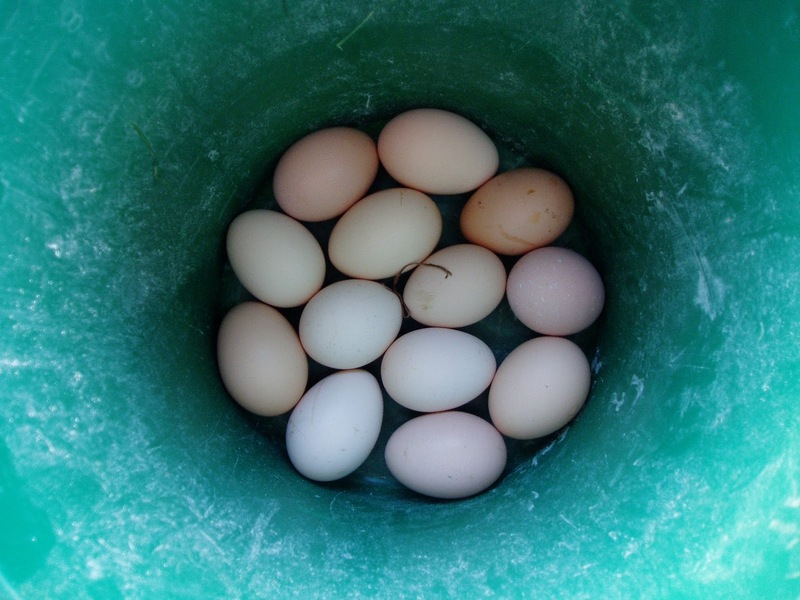 Mine was tame in comparison - Duck Egg and Wild Rose Cheesecake - but it was pretty good if I do say so myself. A picture of a snail dish from last year's cook off. The only problem is that I left my camera there! Hence you haven't had any updates for a while. I haven't been up to too much, but it's been frustrating being without a camera. But today I've had a brainwave - I can take pics with my webcam. Terrible pics and the cord doesn't reach far, but hey, they are still pictures! My sample on the left, my four-year-old daughter's on the right. For the last two Friday's, I've been running a class at one of the local primary schools. 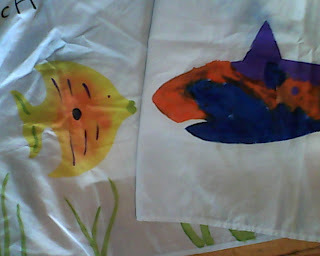 Myself and my team of fab volunteers have been doing fabric stenciling with six-year-old children. I'm counting this as one of my small, experimental quilts as I've had lots of playing with fabric paint and freezer paper stencils to come up with samples. One more class this Friday and it's all done. In exchange for the classes, we get to use their school hall for our guild exhibition - a pretty good deal if you ask me! 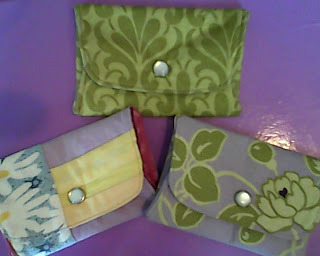 Next, I've been going a little mad on making these cute little purses. They are small and just darling and as soon as my girl spotted the one I made as a sample, she snaffled it and hasn't let me have it back. So I've been making a stack of them for Christmas presents. Some of them will hold vouchers, or a nail kit or trinkets and some will be part of a set (I enlarged the pattern for a bigger one). 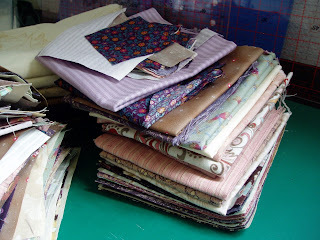 Here's the stack I have made ready to hand stitch up into their proper shape. They come from this tutorial here. Thanks Rashida!! You've sorted so many of my Christmas gifts! 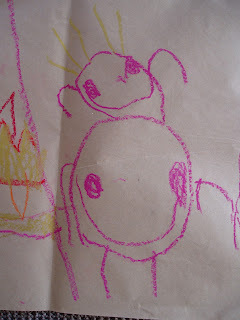 Even my boy has picked out fabrics for me to make one for his 'treasures'. I've also been working on the vege garden (sorry - webcam won't stretch that far) and this morning planted some tomato and basil seedlings and some carrot seeds. It's been dry for the last 3 weeks so I've been spending a bit of time watering too. So that's it for now. 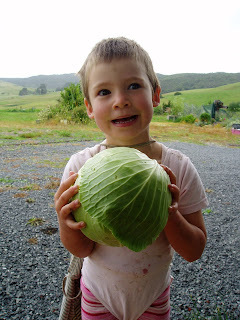 As soon as I get my camera back I'll give you a more thorough round up of the Wild Food party and show you my daughter's funky new haircut! So I haven't been in the blogosphere for a wee while. I'll blame it on the friend who talked me into doing the Kerikeri half marathon. I'll be walking it next Saturday and the training is cutting into my blogging time (it's probably better for me!) 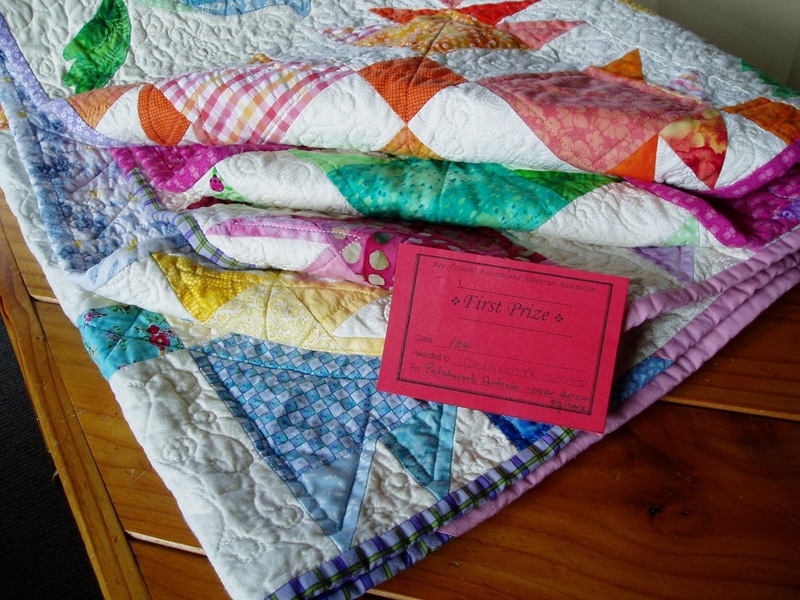 But this Saturday was the Bay of Islands P and I show and my Chicken Flower quilt won first prize in the "Patchwork Article over 40cm" section! Woot! I don't think I've showed it to you since it's been finished and I know the photo above is not the best but every time I try and shoot it, it's windy or dull or too sunny.....I know, excuses, excuses! 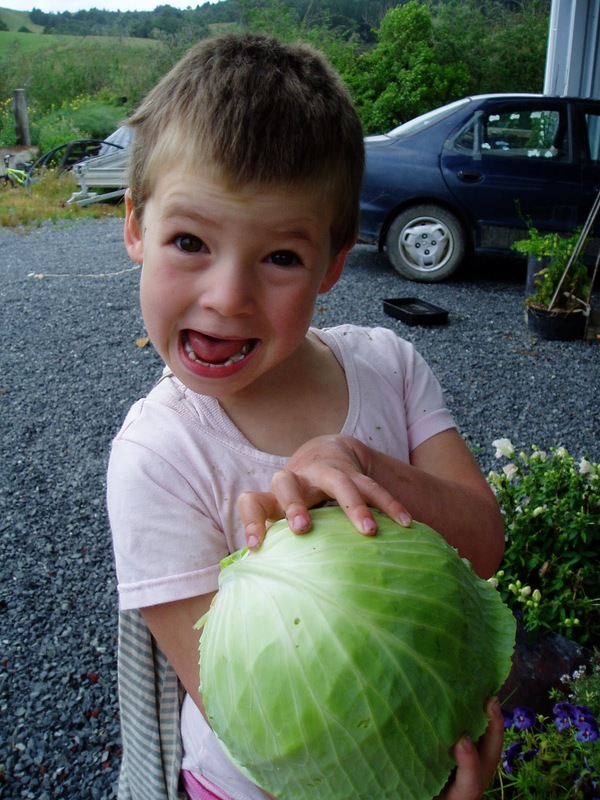 Or I have a little annoying cute helper who just has to be in the shot! 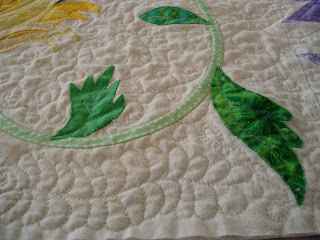 Here's a close up of the machine free-motion quilting I did. Basically just loop de loops and curlicues. But I added a few things in for fun. Like this feather. 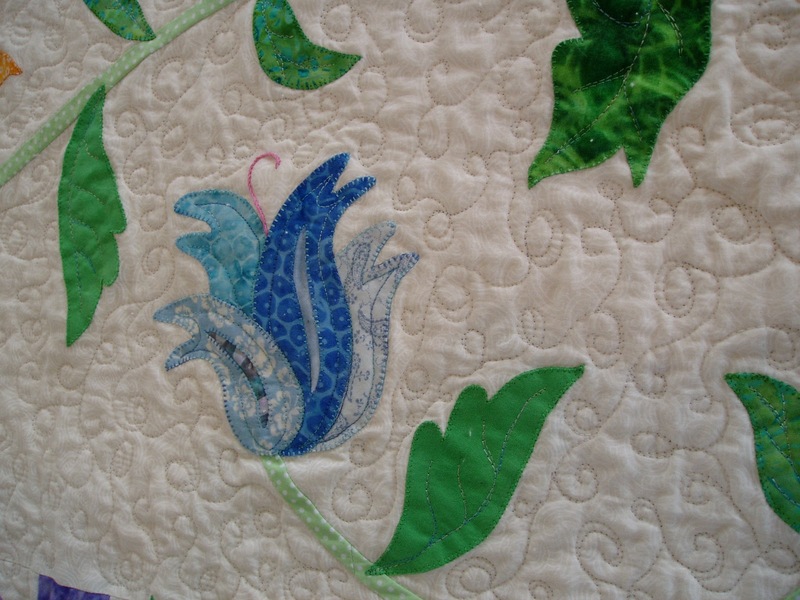 And the recipient's name is quilted into it a couple of times, plus a butterfly and the odd flower and leaf. She can have fun searching for them. So think of me next Saturday - I'll consider myself a success if I finish, I'm not aiming for a particular time! And after that, maybe I'll be able to spend a little more time here updating you on what's happening in my world. 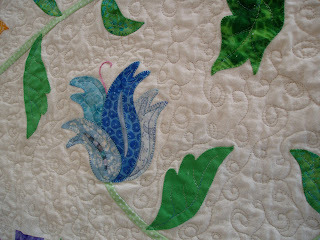 I'm getting ready for my guild's quilting retreat this weekend. I'm hoping to finish my chicken flower quilt there, so today I'm piecing a backing for it. But I have a little helper and when she whipped out my big shears and almost cut straight through the largest backing piece, I knew it was time to occupy her with something else! My scrap bin and bags are favorite toys. 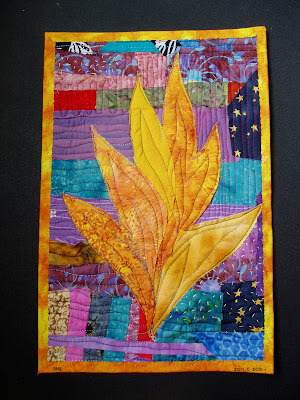 Today it was collage (I've been inspired by all the art quilts I've been looking at lately!). 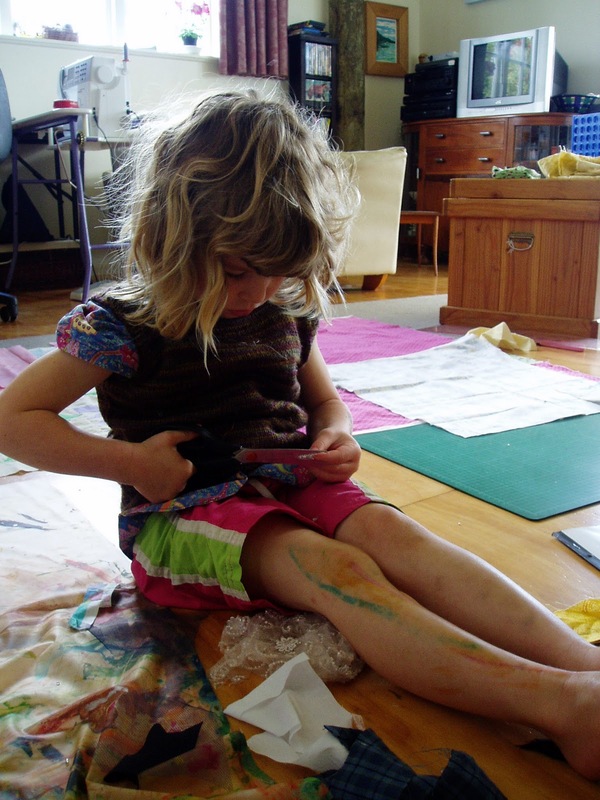 She enjoys using scissors and as far as I can remember, she's never cut herself. Like any true artist, she knows the most important part is making a mess! But my plastic painting sheet kept the glue off the floor at least. And I don't mind helping to clean up the mess if it gives me a chance to get something done. Now I just have to finish machine button-holing some leaves and a teeny bit of embroidery before I can baste it and quilt it. Here's hoping for a productive weekend for you too! These are for my sister, who requested pictures of the animals. I've called it Farm TV, because that is what my hubby and I say to each other when we are going to sit out on the deck and have a cuppa. "Come and watch Farm TV with me." The animals never cease to amuse. Plus, this post fits in rather nicely with Kit Lang's - What do you see on your way to work? This is what I see, they are my work (besides the kids of course). First up are the ducks. They are the loudest and so get fed first. 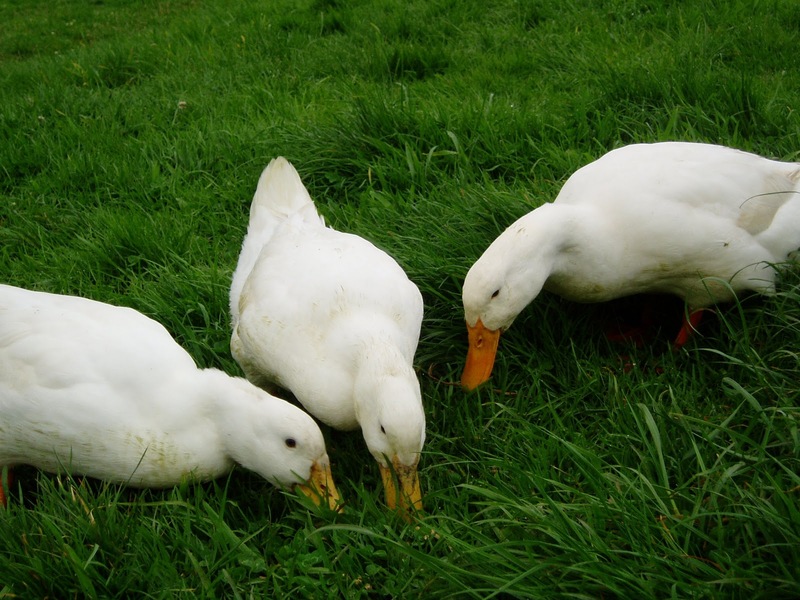 A handful of grain on the grass and for the rest of the day they free roam and keep the slugs down in the orchard. 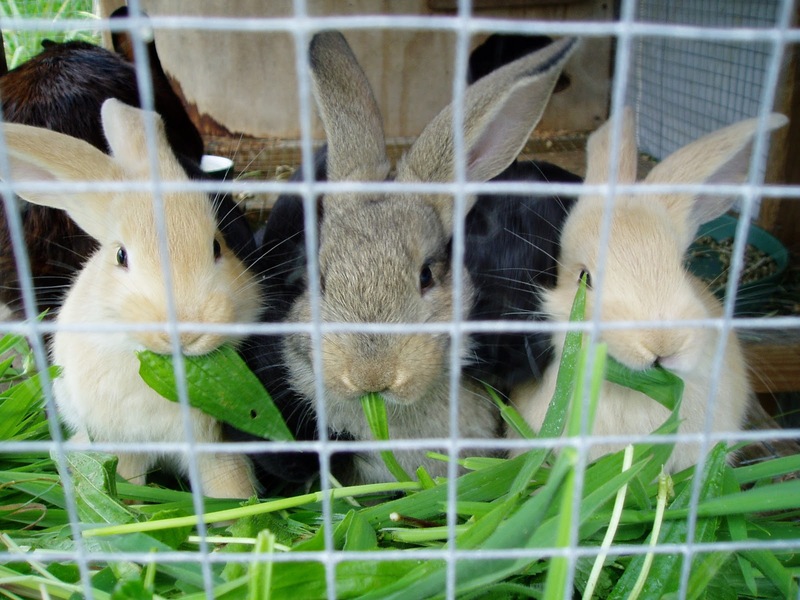 Mama bunny is right next to the feed shed so she gets fed quickly too. Plus she has eight babies with her and they go through a bit of food. 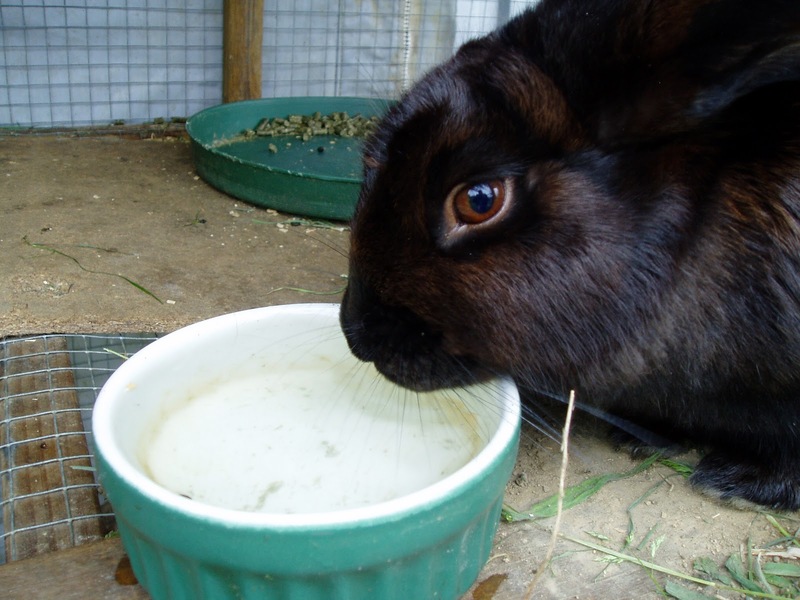 Here she is having a drink. 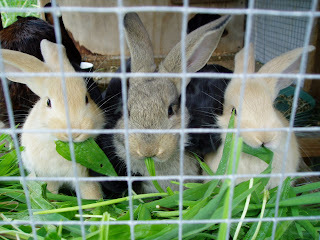 And here are her babies munching their breakfast. Cute huh? 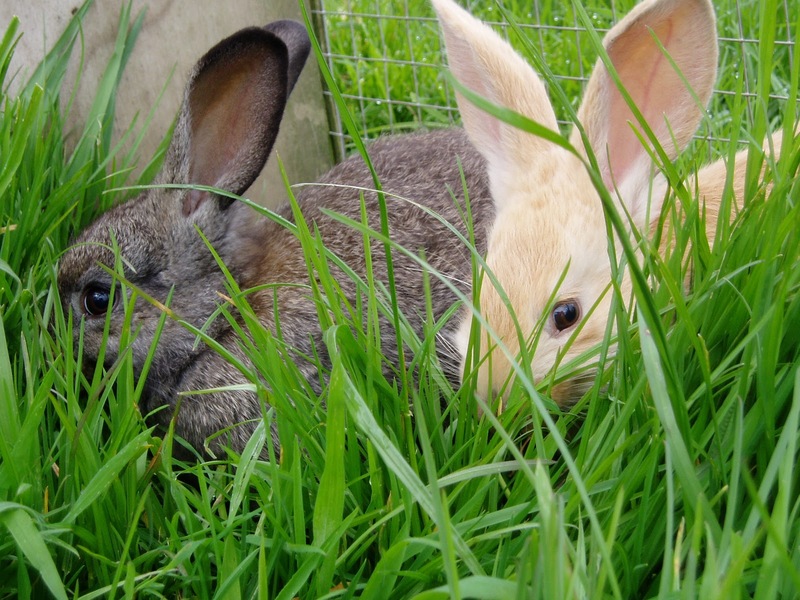 These two are out in a run on the grass - which is rather lush at the moment being spring and all. 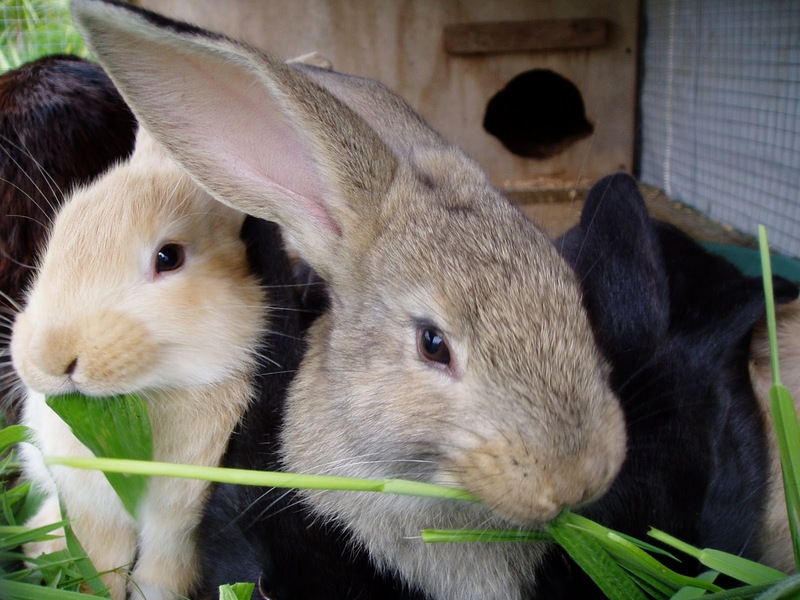 They are part of a group of five boys destined for the pot. They had five sisters who went to the pet shop. 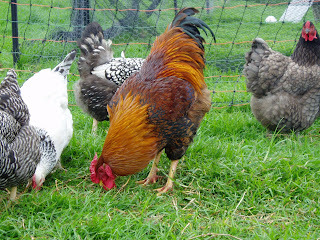 Rooster chicks. Destined for the pot too. 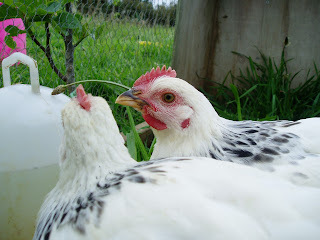 Their seven sisters went to a new home the other day. There are big bonuses to being a girl if you're a chook. 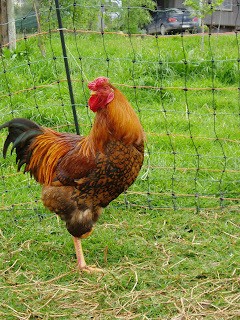 Big Red, the rooster. He originally came from Laura at Our Wee Farm. 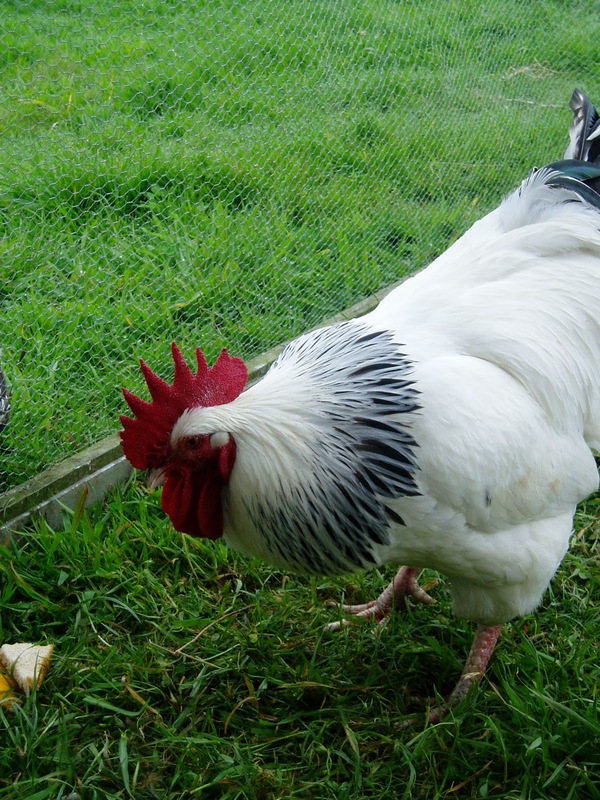 He was destined for the pot too, but he got a reprieve and because he is never aggressive, he might stay out of the pot for a good long while. Big White, on the other hand, is permanently locked up or he'll attack the children. He's on the shortlist for the pot. And here's what the girls give me. Omelette's anyone? But I've managed to fit in a few other things. We've had the nieces visiting for a few days and they joined in the birthday afternoon tea that my boy had for his seventh birthday. Lots of running around was had after the treats and then we had the cake. For those of you who can't decipher what it is - it's meant to be a chocolate pinata cake. You make a cake, ice it and top it with goodies, then make a chocolate shell in another bowl and drop it over the top. Birthday boy gets to smash it with a toy hammer to get to the goodies underneath. Well. Let's just say it was a learning experience! And he wasn't too disappointed that it was already broken when he got to it. If you ever want to make one of these - practice first. 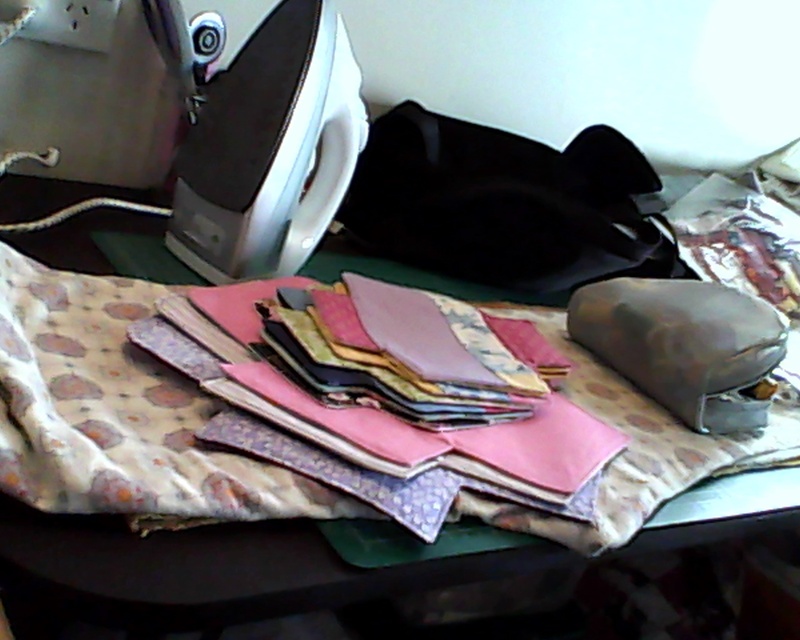 But tomorrow morning I'm hosting my Friday Group of quilters here so I might get a bit of sewing done then. And very soon I'm off on Retreat. 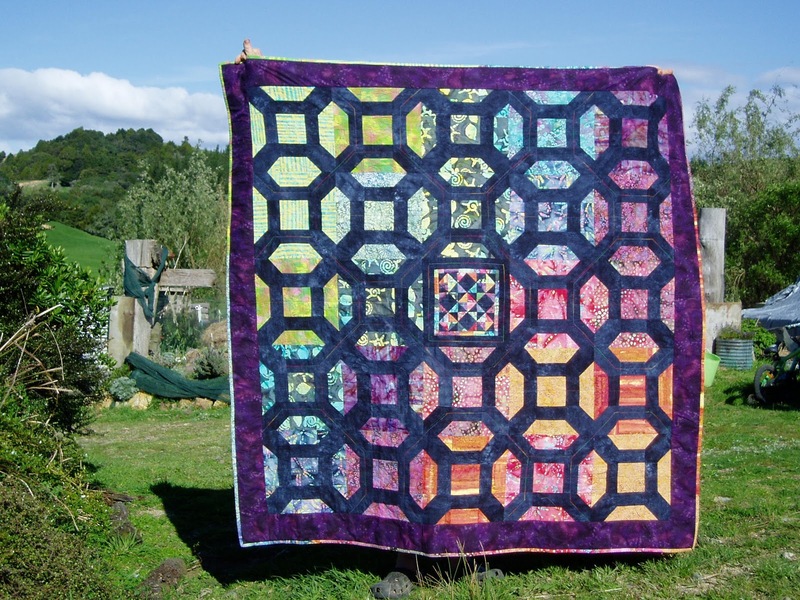 A three day quilt-till-you-drop experience that we hold a few times a year through our guild. I haven't decided what projects I will take, but rest assured I will have something completed by the end of it! 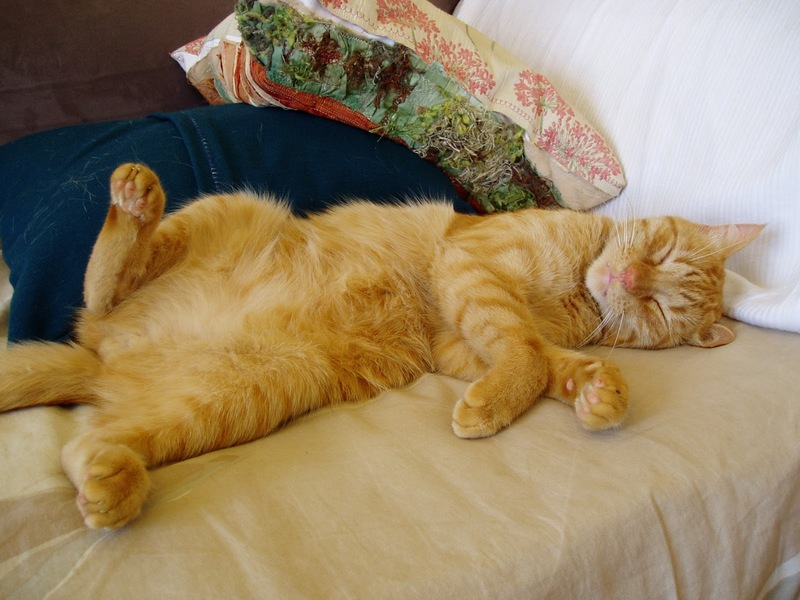 Happy school hols everyone - only a few more days and it's all over. Have you ever seen those pretty stamps in scrapbooking or art shops? The ones with the wooden handles and rubber stamp bit? Yummy designs but a little pricey for just one stamp? Well, here's what I'm doing to get around it - and it's so darn easy I don't know why I haven't done it before! Take one cheap rubber (or eraser if you're so inclined!) and draw your design on it in a soft pencil. Grab your x-acto knife or sharp craft knife and carefully carve away the bits you don't want to stamp (I've coloured those bits in to help my brain recognise which bit to cut). 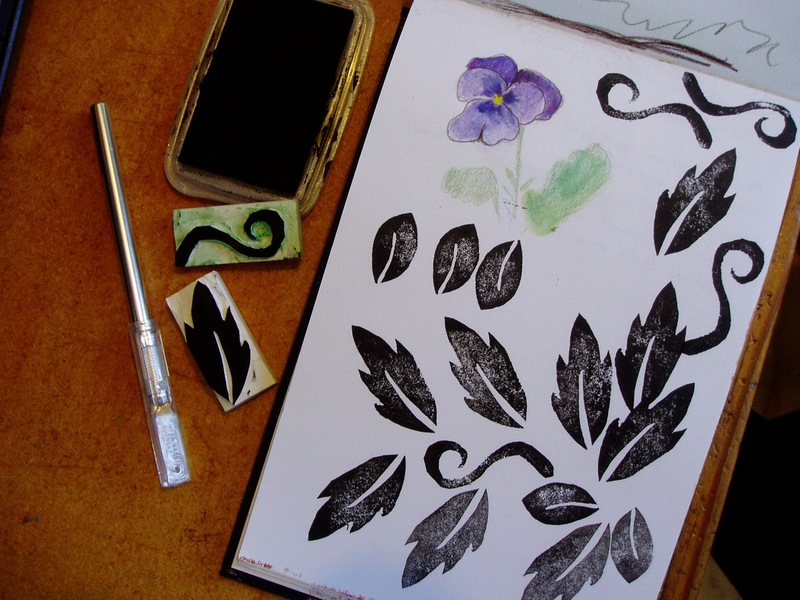 Place your stamp on your stamp pad and happily stamp away. 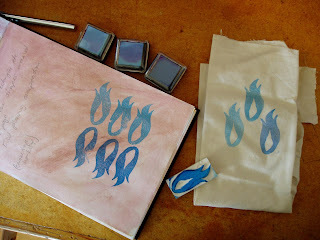 I've used my stamp with paint and on fabric as well as paper. This isn't the method to carve anything really intricate, unless you are very skilled with an x-acto knife, but it's giving me lots of pleasure anyway. Work over your cutting mat (self-healing mat) so you don't blunt your knife if you slip and, just like cutting vegetables, always slice away from your fingers. Wash your stamp in water after using. Heat set your designs on fabric with an iron once they are dry. And carve on both sides of your rubber if you want to be frugal. You can make your own birthday or special occasion cards (and at $5 a pop, I certainly don't buy them anymore unless they are really beautiful), use the designs in fabric postcards, ATC's, art quilts or make your own border fabric for a traditional quilt. 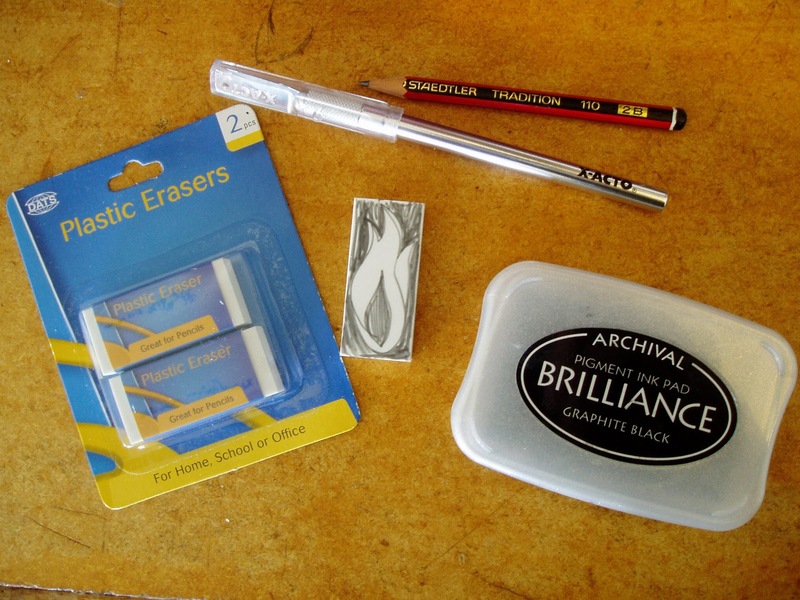 For kiwi's: I found the x-acto knife and rubbers at Stationery Warehouse. The ink pads were from Spotlight and The Warehouse. 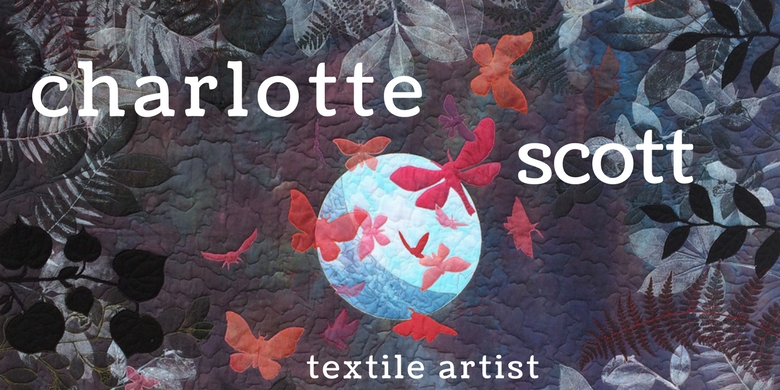 And credit where credit is due, I'm pretty sure I got this idea from watching a preview Quilting Arts DVD with Lyric Kinard. 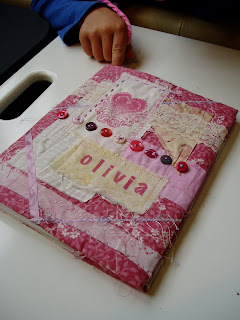 Journal quilts are generally small - often A4 size or 12” x 12”, are made regularly – weekly, monthly etc and are used as a way to experiment and to document. 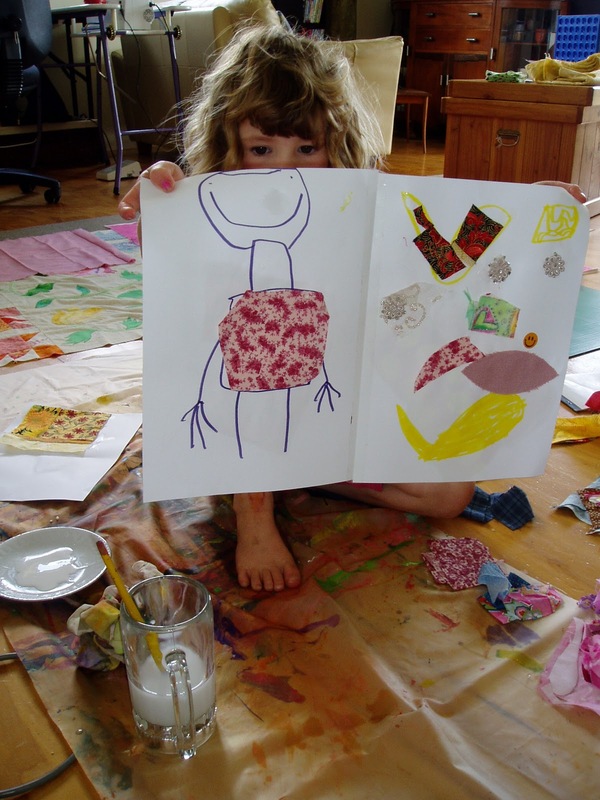 Artist Rose Rushbrooke explains them well here. 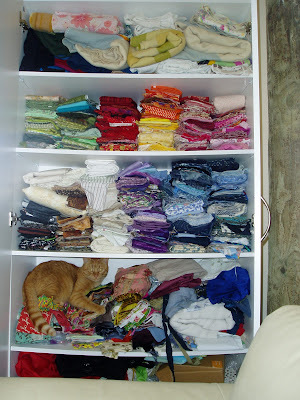 And you can see her journal quilts there as well. 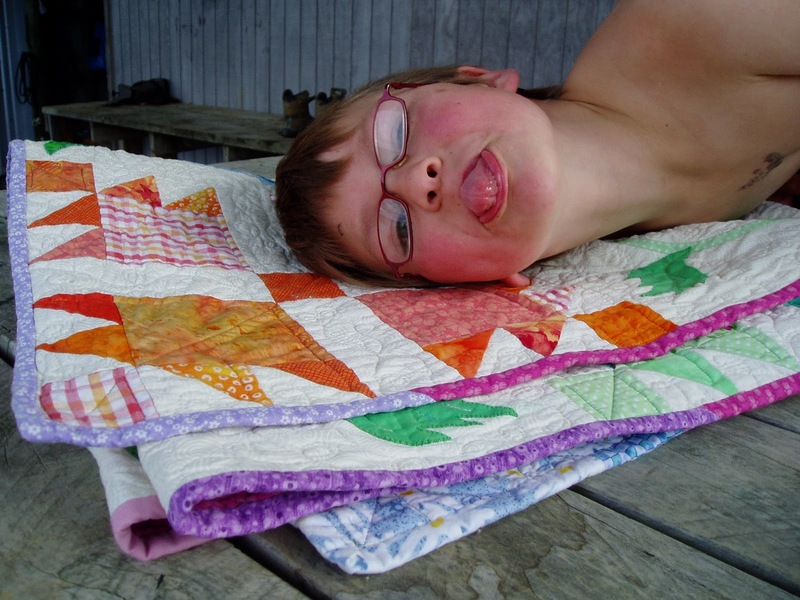 So why am I starting to make journal quilts? 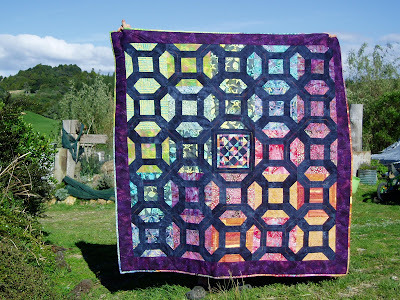 I love traditional quilts, the repetition of pattern can be both soothing and dynamic, the colours can be stunning, but generally the quilts that make me go, “Wow!” at quilt shows and on blogs are the non-traditional, the art quilts, the ones using interesting methods to convey thoughts and feelings. But where to start? And how to continue? I have made a few ‘arty’ bits and pieces over the years and I love to experiment, although I don’t nearly do enough of it. 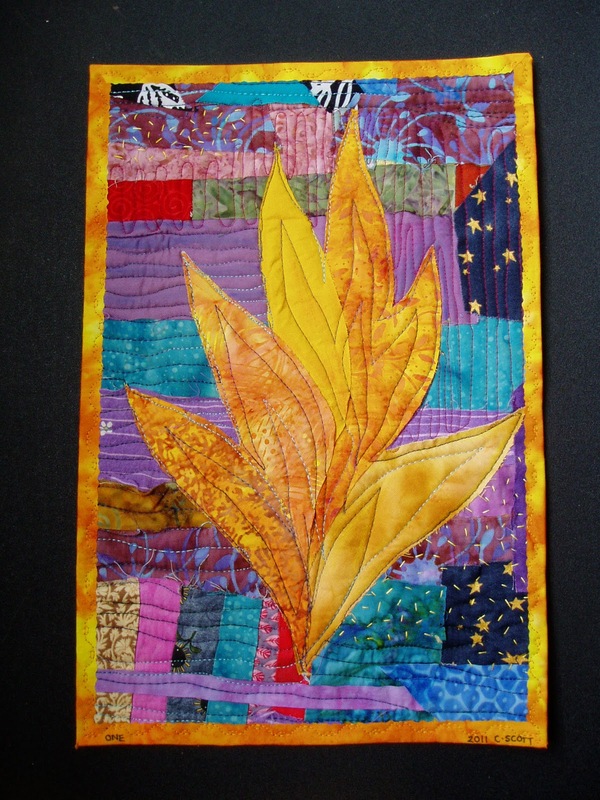 So to get me started and to help me continue, I’ve decided to start making journal quilts. I don’t think I’ll stick to a certain size and I can’t promise I’ll make one every week. But what I am going to do is regularly make a small experimental quilt. 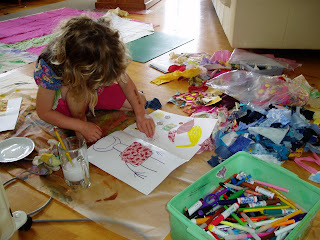 I will not get hung up on making something ‘perfect’ and I’m going to do my best to have fun! ﻿ And here is my first one. I layered scraps and fused some of them down. I free-motion appliquéd a shape that I made in a Jane Sassaman class over the top and free-motion quilted the background down. I used some hand embroidery stitches to create variety in the texture of the background and then I fused a binding that I had cut with a decorative cutter. For me this was just fun, nothing precise, and it made me feel less frustrated that I haven't used any of the things I had done at the Remarkable Symposium. I have never fused a binding or used a decorative rotary cutter either. 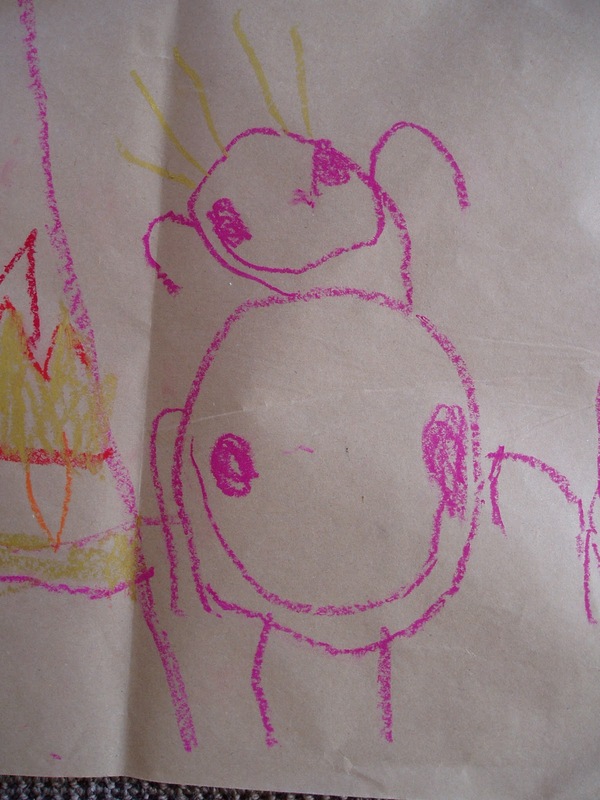 And, just because it's so sweet it makes my teeth hurt, here is a drawing my four year old daughter did of her riding on her father's shoulders. Awwwww! A sunny day means a photo shoot. 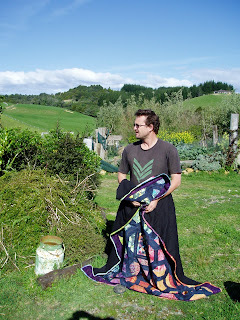 Except that a photo shoot with my husband means a very short window where he will hold up quilts for me. I can't say "turn it just a wee bit that way" or "just a little higher" and definitely not "one more minute until the wind stops blowing"! Oh well, I still love him dearly (he cooked dinner tonight so I have to say that). These are both quilts that, when I began cataloguing them on my 'quilts' page, I realised I had never taken pictures of them finished. This is my boy's sixth birthday quilt and he's about to turn seven. I designed all the blocks myself. 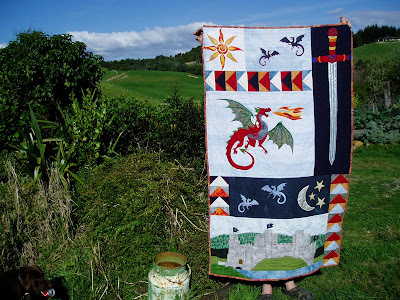 And it was a bit of an adventure in quilt-as-you-go! And this one was one is called 'Indonesian Windows'. I finished it in 2007. It was begun when my sister proposed a challenge. We could only use the block given but colour it any way we liked and make it any size. 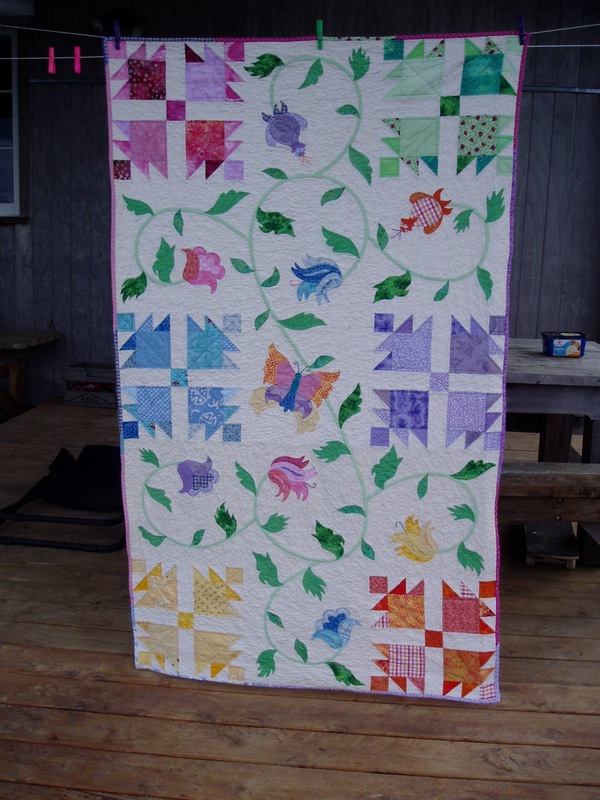 And here's the quilt holder-upper saying,"C'mon already! My arms hurt!" 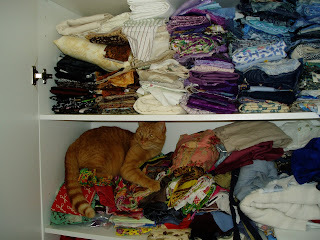 I don't make quilts for people allergic to cats. Spot the interloper. 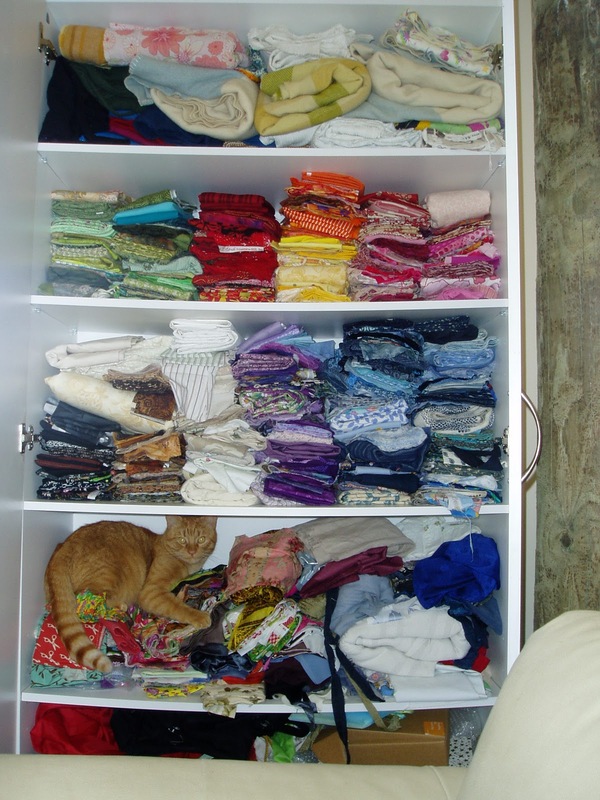 And it's not the teal blue fabrics in the green pile. No, it's the orange furry thing taking advantage of the 'yet to be organised' shelf. Puss - can't you find somewhere else to catnap?